The burning of propellant, and the friction of projectiles accelerating down the barrel and being gripped and rotated by the rifling, combine to generate considerable heat in gun chambers and barrels. The higher the rate of fire per barrel, the more heat is generated and the less time there is available for it to be dissipated. The problem is also exacerbated by high-pressure, high-velocity cartridges. Heat generation causes two problems. The first is that after firing, the heat of the chamber might be enough to ignite, some time later, the propellant in a cartridge left in the chamber, with potentially disastrous results. This is known as "cooking off" and is overcome in most heavy weapons by ensuring that the chamber is left empty after use. In linear weapons, this is achieved by designing the gun to fire from an open bolt, i.e. the bolt is held back after each burst (an inherent feature of API blowback weapons anyway). 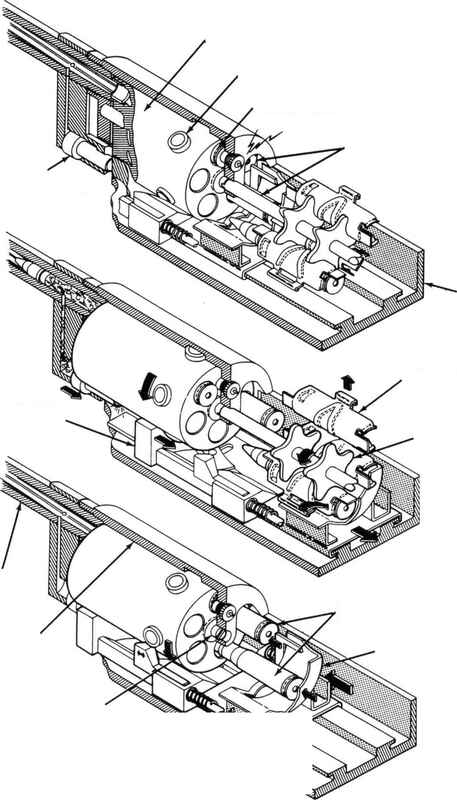 In the case of revolver or rotary cannon, the mechanism is generally arranged to ensure that the multiple chambers are cleared at the end of each burst. 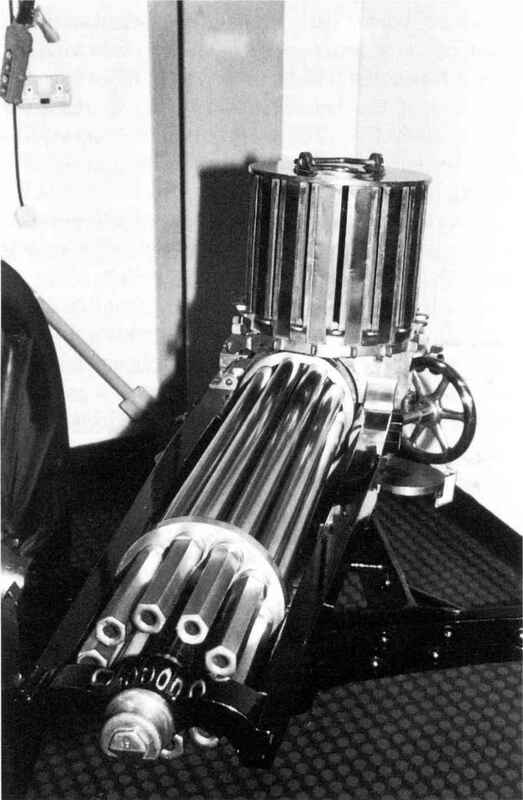 In the larger American rotary cannon this is achieved by reversing the mechanism in order to load unfired cartridges back into the feed. There was a problem with open-bolt firing in the past in the case of aircraft guns which were synchronised to fire through the propeller disc. The accurate timing necessary to avoid shooting off a propeller blade meant that the instant of firing had to be under precise control, which could be achieved by firing from a closed bolt or, where open-bolt firing was retained, by separating the initiation of the firing cycle (by pressing the firing button to chamber a cartridge) from the ignition of the cartridge (controlled by a mechanical or electrical link from the propeller). In the case of the synchronised .50" Browning M2, pilots were instructed to lock the bolt to the rear for two minutes after a long burst of fire. The second problem is more difficult to overcome. In extended firing, the barrel and chamber can reach such high temperatures that they glow visibly. Initially, this will result in a much increased rate of wear of the rifling. 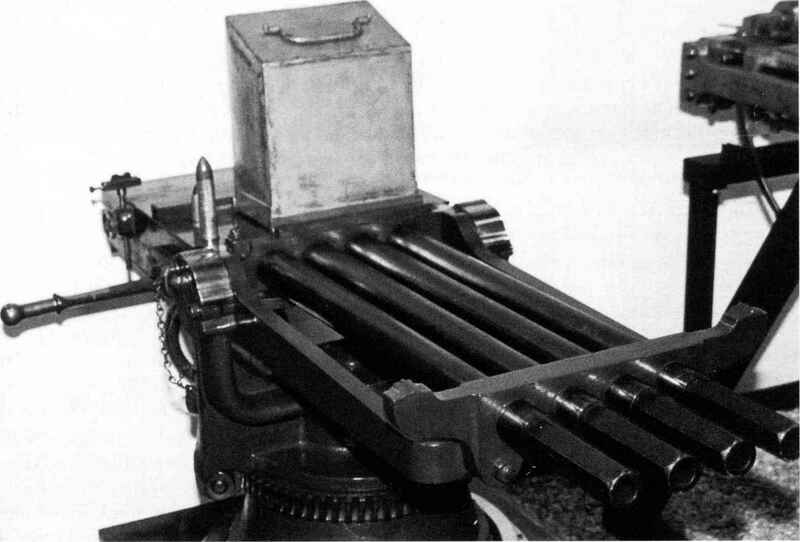 Again taking the .50" M2 aircraft gun as an example, about thirty seconds of continuous firing was enough to ruin the barrel. In extreme cases, the mechanism loses its integrity and becomes jammed. This does not always matter. Aircraft guns are only used in short bursts and have a high-speed airstream to keep them cool. Aircraft also usually return to base between missions, where the gun barrels can be changed if necessary. Indeed, in the case of the latest revolver cannon, combining a single barrel, high velocity and an extremely high rate of fire, it is reportedly not unknown for the barrel to be changed almost as often as the magazine is reloaded. Even so, restrictions on weapon firing have been applied. For example, Second World War US fighter pilots were told to fire 20mm bursts of no more than twenty rounds and preferably ten, with 37mm figures being fifteen and five respectively. Ground- and ship-based guns have to find other means of overcoming the heat problem. It has always been common for shipboard automatic guns of all calibres to have water-cooled barrels, as the added weight and complication are less of a problem. Russian armament firms, exercising their usual inventiveness, have even managed to provide water-cooling to rotary cannon. In the past, water-cooled guns have been easily recognisable because of the large-diameter water jackets. Modern weapons use pumped systems which have very slim jackets. At least one of the Russian rotary cannon and their 30mm 2A38M twin-barrel A A gun, use "transpiration cooling', which relies on the evaporation of a cooling fluid. Water-cooling has also been common in ground-based guns in the past - the Vickers machine gun range, for example - but has since fallen out of favour as it is more suited to a static battle where arrangements can be made for a reliable supply of water. Instead, heavier barrels with greater capacity to absorb heat are fitted, sometimes finned or fluted to increase the surface area and thereby assist cooling, and the barrels are commonly lined with Stellite or some similar heat-resistant material. In heavy machine guns, it is common to emulate the practice of lighter automatic weapons and provide spare barrels along with a quick-change barrel design. Franco-Prussian War of 1871, but did not last for automatic weapon scene until the mid-1940s. much longer in the face of competition from the new machine guns. By far the most famous of the early manually powered guns was a rotary weapon, the Gatling, named after its American inventor Dr Richard ered. The external power source was manual labour, John Gatling. The earliest working models in that the guns were made to operate by the gun- appeared in 1862, but it was the adoption of the ner cranking a handle. The rate of fire was therefore copper, rimfire cartridge in 1865 which led to its largely dependent on the energy of the gunner, and success. Several barrels, each with its own chamber tended to slow down as the gunner tired. dropping into a trough between the bolt and the chamber associated with each barrel. As the mech-opment of the cartridge permitted the first effective anism rotated, the bolt was pushed forward, chambering the cartridge which fired as each barrel reached the bottom (six o'clock) position. Further rotation extracted and ejected the empty case. Most Gatlings were made in the rifle calibres of the day - .45" (11.4mm) or larger - but some .65" (16.5mm), .75" (19mm) and 1" (25.4mm) weapons were made, primarily for naval use. The number of barrels varied between six and ten, with ammunition usually being loaded into hoppers or vertical guides. The linear guns, mainly produced by Gardner .65" Gatlings. and Nordenfelt, were also successful but achieved Although the British used Gatlings in various less publicity. The Gardner was developed by an calibres, they preferred the linear weapons, the American, William Gardner, in the 1870s but ini- Gardner in particular being considered the best tially adopted by the United Kingdom. It again of them. With one or two barrels, it was appreciated a rotary crank handle to move the bolts back- bly more portable than the Gatling and was wards and forwards, only in this case the chambers accordingly used by the Royal Marines in various and barrels were fixed in place. The original version colonial battles. 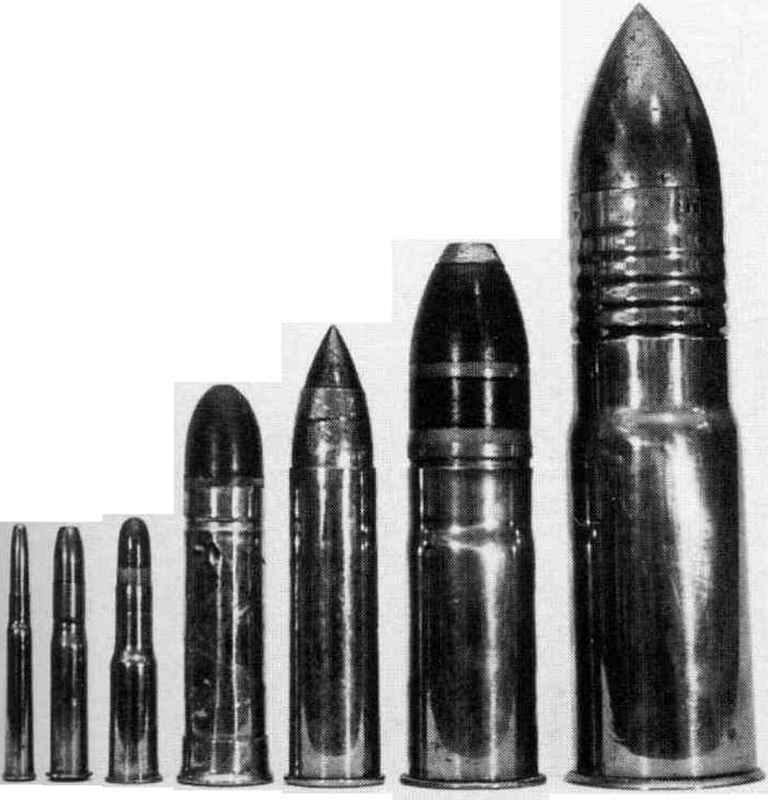 By the end of the nineteenth cen-had two barrels which fired alternately, each having tury, all externally powered weapons had been its own gravity-fed ammunition supply, but versions reduced to obsolescence by the new self-powered with one, three and five barrels were also developed. weapons, commencing with the recoil-operated It was only ever available in rifle (.45") calibres. Maxim. 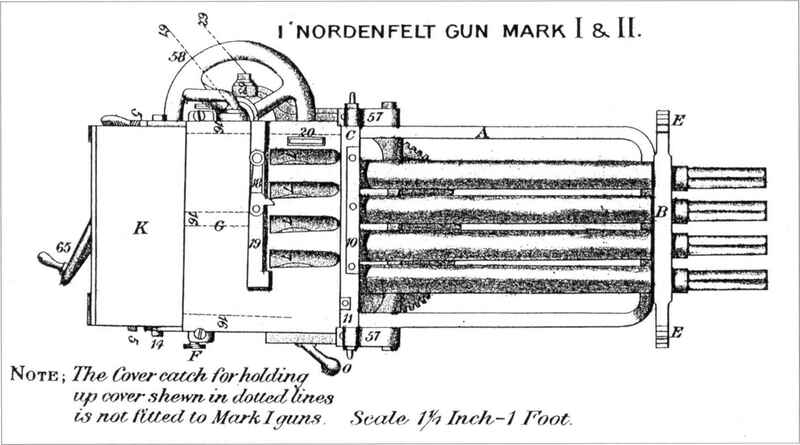 I NORDENFELT GUN. MARK I AND II. Alls cents cere- being eUtiemVto sizttTvctdin/j ftofrrisiTncfs. unlocked; the barrel is then stopped and the bolt continues its rearward movement alone, extracting and ejecting the fired case before reaching the rearward limit of its travel. The return movement of the bolt chambers a fresh cartridge and relocks the bolt, as in the long-recoil system. The drawback of recoil-operated guns is that the barrel has to be free to slide to and fro while its support is engineered closely enough to maintain acceptable accuracy. Some mechanical means of locking and unlocking the bolt and breech at the appropriate moments are required, and variations in how this is achieved are the main distinguishing features of the different designs to have seen service. This type of mechanism has proved to be very suitable for heavy automatic weapons and is still in common use today. 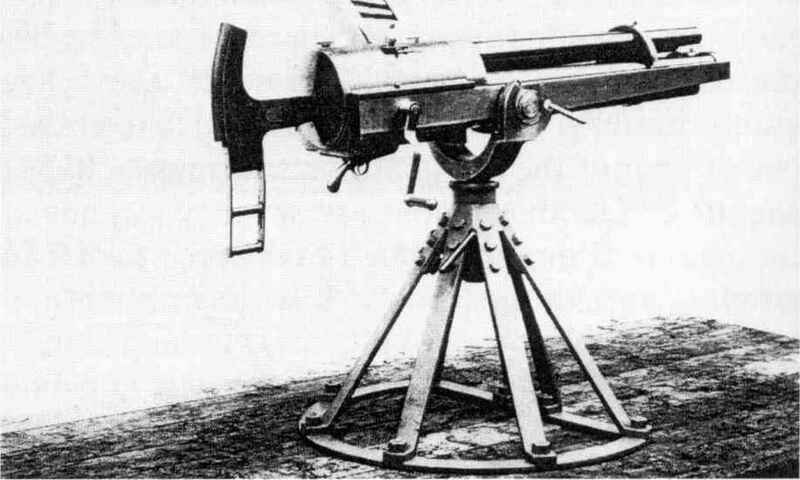 Despite this, it was the first self-powered mechanism to appear, in the Maxim machine gun family. Can 37 X 94R de can Hotchkiss? Can machine gun barrels be used again after they cool down? HOW TO COOL MACHINE GUN BARREL? 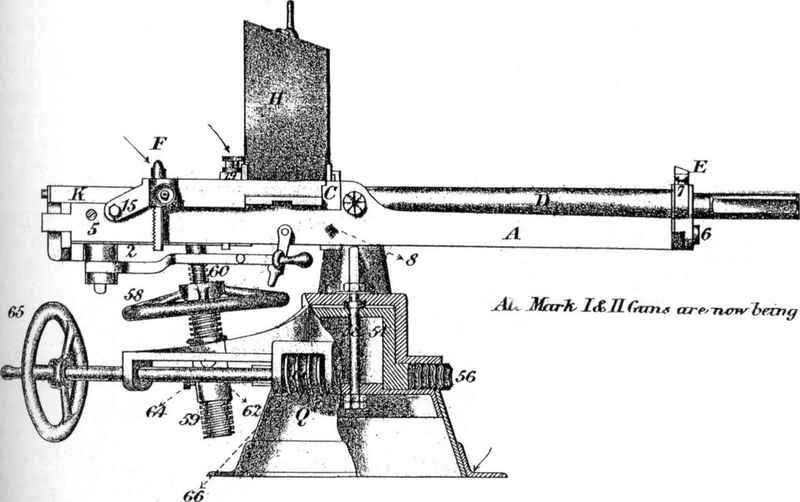 How to get gatling gun 1862 plans? How long wil a 105mm cannon barrel last in continous firing? What is the part that cools the barrel of machine guns? How are modern machine guns cooled? Are Military Machine Gun barrels made with a tight bore because of heat expansion?